When machined components are the building blocks of your final product, poor quality, late deliveries and rising prices from your suppliers not only cost you money, but also time and reputation. At Pneumadyne, we understand just how critical these issues are. Producing high quality components and meeting demanding production schedules is our job. For over 35 years, Pneumadyne has been known for the design and manufacture of high quality pneumatic products. During the past 10 years, our manufacturing expertise has also been of value to customers in need of machined components. Our modern machine shop features both CNC Milling and Turning Centers. By utilizing technologically advanced machines, we are able to guarantee the accuracy of the components that we produce. 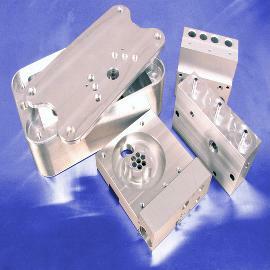 All of our machines are able to maintain very tight tolerances, most often within +/- .002”. Pneumadyne’s Milling Department is comprised of two horizontal machining centers with automated palletized loading, five Vertical Milling Centers equipped with multiple high-tech accessories to ensure the production of quality components in the shortest amount of time possible. Rotary Index Tables enable us to machine multiple sides in a single production run; saving time and money. Side Mount Tool Changers ensure that very little time is wasted in non-value added machine movement such as tool changes. Our state-of-the-art Turning Department features 24 Swiss Multi-Axis Turning Centers which give us the ability to produce complicated parts at ultra high speeds. All of the tools in these machines simultaneously carry out separate operations to achieve optimum machining and reduce idle time. The addition of magazine bar feeders on all 24 of our Turning Centers allows us to run “lights out”, or unattended, giving us 24-hour / 7 days a week machining capacity. All of our machines are able to accommodate a wide variety of materials from aluminums, brass, steels and stainless steels to plastics such as nylon and polypropylene. While the Milling Centers can accept large pieces of material, our Turning Centers quickly and efficiently cut bar stock sizes ranging from 5/64” to 1 1/4”. Secondary services such as heat treating, plating, grinding and pre-applied sealants can also be provided. Pneumadyne received ISO 9001 certification in 2004. Stringent quality management systems, standards and guidelines ensure that we are producing components that meet and exceed the highest of customer standards. Product quality is of the utmost importance throughout our machine shop. Continuous inspections during the production process guarantee that components meet our machining and design requirements. From print to part...Pneumadyne is your source for precision machined components. Contact us for a quote today.